I am a distressed and concerned Digital Marketer from India, who is very much afraid and in speculation regarding the future of the Digital India in 2015. And via this letter, I am trying to share my concerns in a logical way. To start with, I must admit that you have tried your best to ruin this New Year with your ridiculous decision of banning 32 websites, citing terror threat. Although some good sense prevailed and you decided to unblock 4 websites, but the damage has already been done. Freedom of Speech has been threatened and the whole concept of Democracy is in ruins. Several websites (around 300, if I correctly remember) were blocked during that time, citing hate messages erupting after communal riots in Assam. Yes, Shri Narendra Modi had turned into an activist during that time, helped us to get our rights back. And we trusted him, and decided to vote for him as we needed a personality who understands what freedom is, and who can help us with growth and development on the foundation of equality. It seems that the trust, the belief that we have voted a person who can revolutionize India is now shaken, to be very honest. Yes, I do understand that you have optimally used the Section 69A of the IT Act to block the flow of information via any computer or electronic device, but I am afraid, there is no applause this time. What you are actually receiving is contempt and shame from our own countrymen. If you can study a bit about Internet, and understand how it can bring in a social/political revolution, you will be surprised to know that by blocking 30 odd websites, you can never, I repeat never be able to crush the power of knowledge. Infact, this brutal act of yours will ignite, give fire to the movement in an unprecedented way. When protestors in Hong Kong found Internet to be banned, they used a new application which allowed them to pass messages without using Internet. Protestors in Egypt used Twitter to bring in a Government change, and when they banned it, they shouted and distributed papers with their messages. Will you ban the process of writing and thinking as well? Internet is like a deep, black jungle, and if some trees have caught fire, you can’t blow the wind to put off the fire; it will only spread far and wide, making your decision look ridiculous. As I have come to know, the person who decided to block these 32 websites (and later unblocked 4 of them), made his decision on the fact that the captured ISIS member from Bangalore used these websites to propagate his hate fuelled messages to other ISIS sympathizers and supporters. But, do you really believe that by banning these 28 websites, you can stop the flow of information? When a forest catches fire, experts douse the flames by using water, which soothes the heat. Instead of banning and blocking the websites as a reaction, why don’t you spend some time on the issue, and try to understand what exact is the problem? Why our nation’s youth will ever dream of joining an extremist organization and indulge in mindless jehad? Trust me, even if you block all the websites ever created on this Earth, people will find a way to bypass it, and use it anyhow. In this age of connected economy fuelled by Internet, you can’t ban a thing. It sounds so childish and like a page out of an 18th century manual for enforcing discipline. Sir, banning websites is a symbol which denotes emergency, a wicked, evil reaction to a problem which is so huge that you can’t even find a solution except banning the medium? I am a regular Internet user, who uses these websites to share my knowledge and expertise with the world. Like me, there are hundreds and thousands of users who use these websites to share their side of story, their programming codes, their words and emotions with their well-wishers. And basically, the whole Internet works the same way. If the Digital India dream which you have shown us is just a dream, and not a reality, then I am very sorry to interrupt, but you have failed. Failed miserably in your mission to join and develop India using the Digital Medium, and to provide Information as a Fundamental Right, just like access to fresh water and Dignity of Choice. As a common man, I am shocked and hurt by your decision to ban websites, and I hope that my Open Letter introduces some sanity in your decisions, which has the potential to impact 120 crore people of this country. I look forward to 2015 with a new hope and with a new beginning. Please help me in that endeavor. 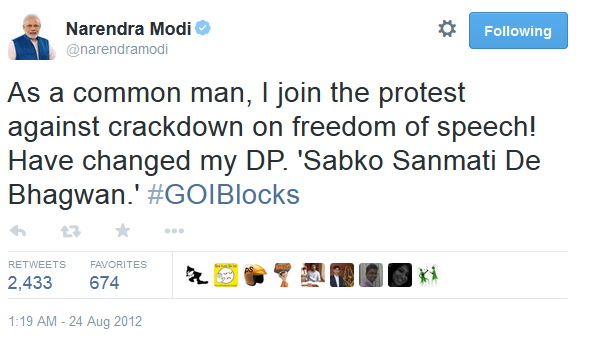 ok. its customary on the part of governments to block websites and social media properties to avoid “communal riots”. but i still believe we are a free country compared to several other nations. see the government bashing and ridiculing governments by media on its policies and actions. but banning a code repository like github is meaningless. Hey, please understand that “freedom of speech” and writing something hateful to instigate violence are two different things. Government is NOT banning freedom of expression in any way. Everyday we read harsh criticism on politics, policies and almost every government matter. It is not like China or N. Korea where people are subject to a government propaganda. The ban, as I understand, is to curb malicious spread of hate and communal violence. History will show that it is really easy to do so in India. That’s why we need controls. Unless the websites have an efficient review mechanism in place, it’s best to ban them. Otherwise they are facilitating a crime. I think sometimes it is important to ban some websites as it can compromise the National Security. I agree they should have first contacted the owners of the websites before banning but then this is not a permanent ban, they are going to lift the ban soon. This case of websites being banned is not a violation of Freedom of Speech, but it is infact for our safety. Your comparison of the ban of 300+ websites by the then Congress Govt and the current ban is irrelevant. That ban was to stop rumors from spreading and this ban is to stop the communication channel. Very rightly said Mohul. We’ll get an alternative way to overtake this issue. But my hope is ending day by day with the act of Mr. Narendra Modi, though I was a great fan of him.